One of the pleasures of photography is finding a new subject, a new topic to document through pictures. 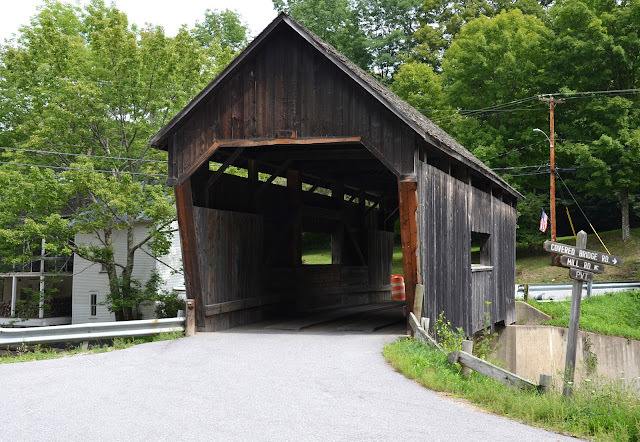 When my family was on vacation in August in the state of Vermont, I was looking for interesting things to do in and around the Montpelier region. On a tourist map of the state, I noticed a cluster of four icons in the town of Northfield Falls, about 11 miles (17.5 km) south of Montpelier, the capital of Vermont - indicating a local concentration of covered bridges. 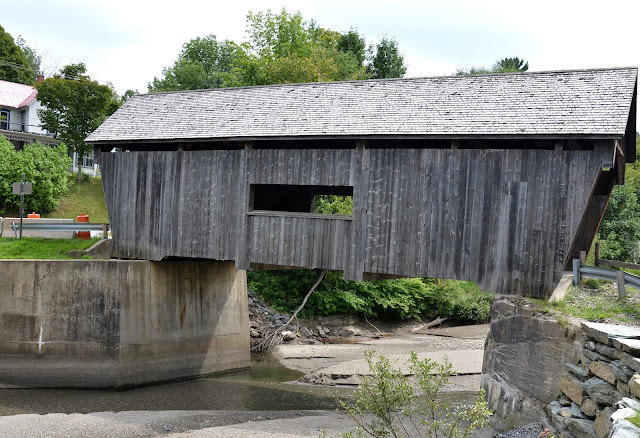 I knew about covered bridges but I’d never photographed one before. 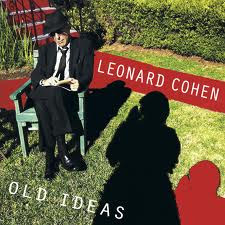 I had my new subject. 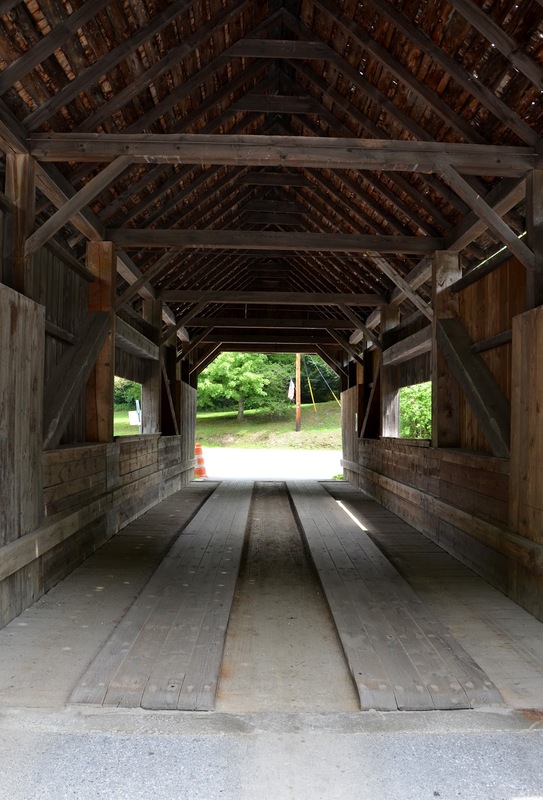 Covered bridges – built primarily of wood – are designed to protect the bridge structure from the harsh winter elements. The roofs keep most of the snow and ice off the roadway. The bridges are relatively small, spanning creeks or small rivers. The covered bridges in Northfield Falls cross Cox Brook and the Dog River. Approaching your new photographic subject, you look for interesting angles and perspectives. Avoid the head-on shot; do an oblique or sideways shot that gives a sense of the object's three-dimensionality. There are about 100 covered bridges left in the state of Vermont – which means it has the highest concentration of the things in the country. 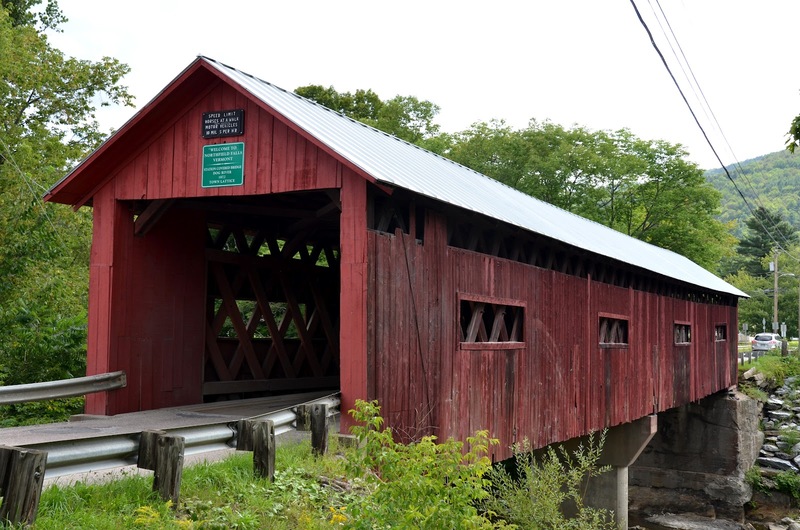 And the group of five covered bridges in Northfield Falls is the second-highest concentration in the state. I had come to the right place. Avoid flash - as always. Here the Nikon D7000 demonstrates how well it copes with low-light situations. 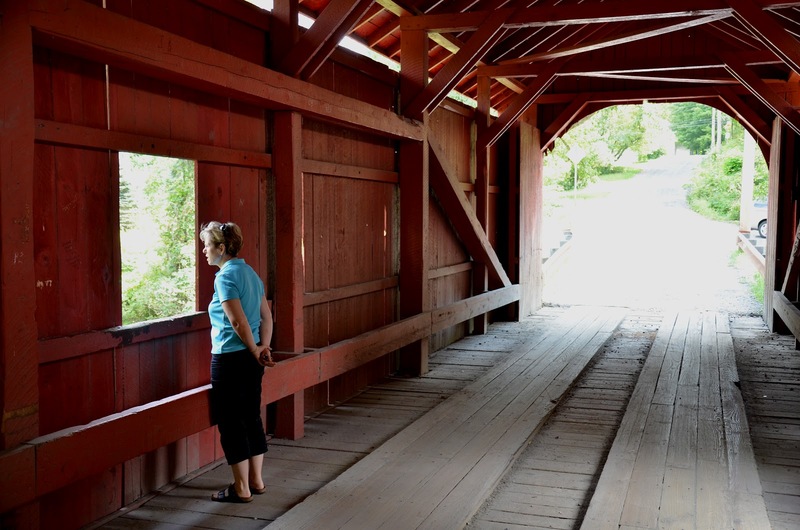 Most covered bridges have windows that allow pedestrians to gaze down-river or up-creek. 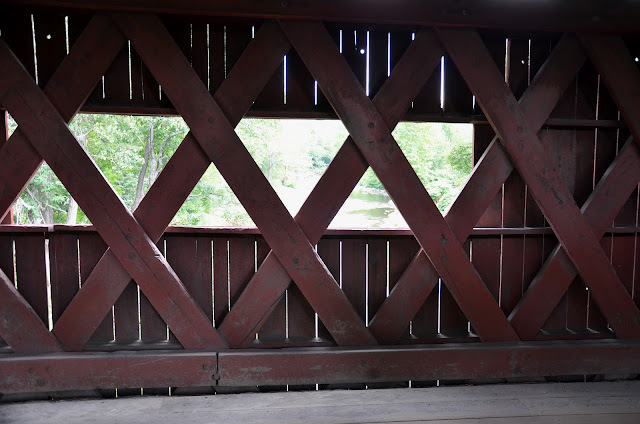 This first bridge (in the four pictures above) - the "Station" bridge (most Vermont covered bridges have names) - was built in 1872 using the "Town Lattice" design. It is 137 feet long, crossing Dog River. It's located in Northfield Falls, on Cox Brook Road - about 150 metres from the town's main street. The bridge is painted in red ochre - the de rigeur colour, apparently - although one of the four bridges I photographed was different. This bridge is 16 feet wide (5 m) and has a 12 foot (3.75 m) vertical clearance. A sign on both ends of the bridge indicates that the speed limit for vehicles is 10 miles per hour, and that travellers crossing on horseback should walk across the bridge. The "Newell" bridge uses the more familiar "Queen Post" design. It was also built in 1872. It crosses the Cox Brook. As the sign says, only one vehicle at a time can cross here. Most covered bridges in Vermont are painted with a red ochre-coloured stain; but some are white, some are brown, and some are grey. Some of these bridges have windows; some don’t. The “Second” Newell bridge (above) is shorter than the “Station” bridge – only 56 feet (17 m) long. It’s about the same width (4.7 m). 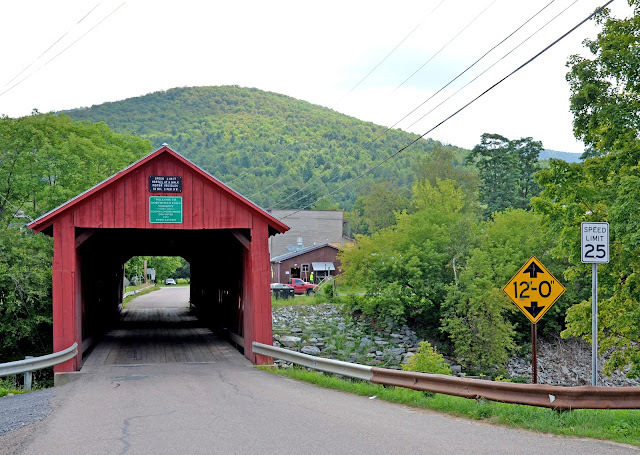 There’s another covered bridge nearby on Cox Brook, so this one is also referred to as the “Lower Cox Brook” bridge – as opposed to the “Upper”. 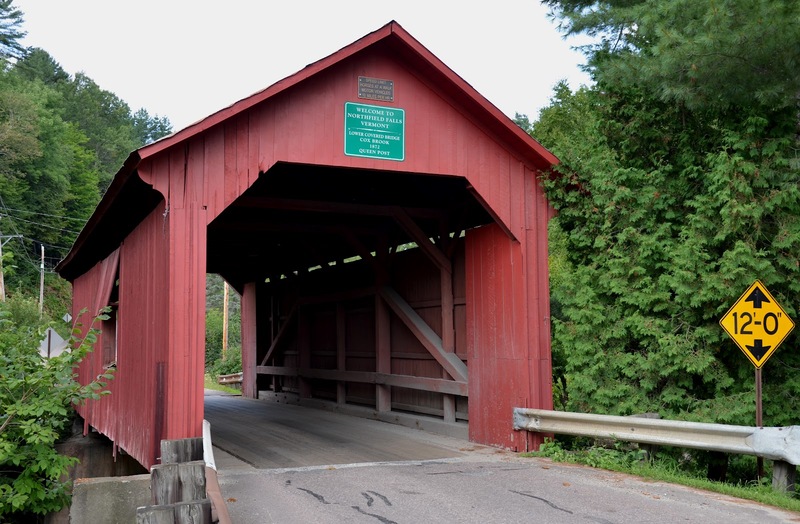 The third covered bridge we visited (above) in Northfield Falls is called “Slaughter House”; it’s on Slaughter House Road, which used to lead to a former slaughter house – now closed. Barb looking out the window on the "Slaughter House". A good view inside of the "Queen Post" design. This bridge uses the “Queen Post” design and was built ca. 1872. It is located on Bailey Street. It’s 59 feet long and spans the Dog River. This picture (above) shows how the floor of the bridge is reinforced to handle vehicles – the long planks parallel to the roadway are laid perpendicular to the horizontal planks beneath. The view of Dog River looking north from "Slaughter House" bridge. To find Northfield Falls, drive east from Burlington, Vermont on the I 89 to Montpelier, and then go south for about 11 miles on Route 12. It’s an attractive town. We stopped for lunch in a local diner. And then went looking for the covered bridges. Side-view (from the south) of "Slaughter House" bridge. "Warren" bridge, spanning Dog River - just north of Warren (seen from the western side of the river). 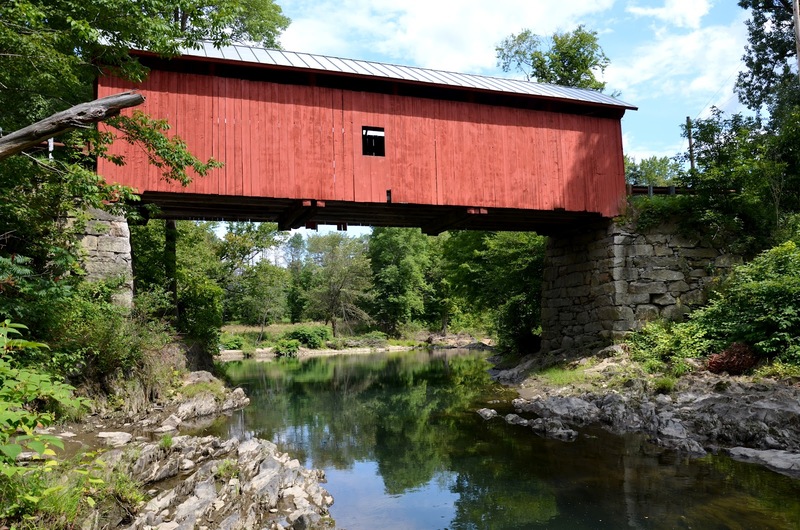 The fourth, and final, covered bridge shown here is the “Warren” bridge. 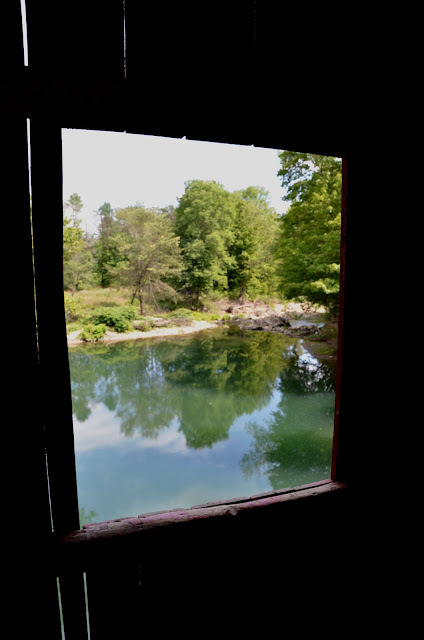 To get to it from Northfield Falls, you drive south on Route 12 to Roxbury, and then cross the mountains on a partially-unpaved road for about 8 miles to Waitsfield. Then you take Route 100 south until you are just south of the village of Warren. The “Warren” bridge is just east of Route 100 on Covered Bridge Road. Side-view of "Warren" bridge looking from the north; it spans Mad River. “Warren” bridge crosses Mad River. It is 57 feet long (17 m) and 14 feet wide (4 m). It was built by Walter Bagley in 1880. One of its unique features is the eastern portal, which extends further over the approaching roadway than the western portal. 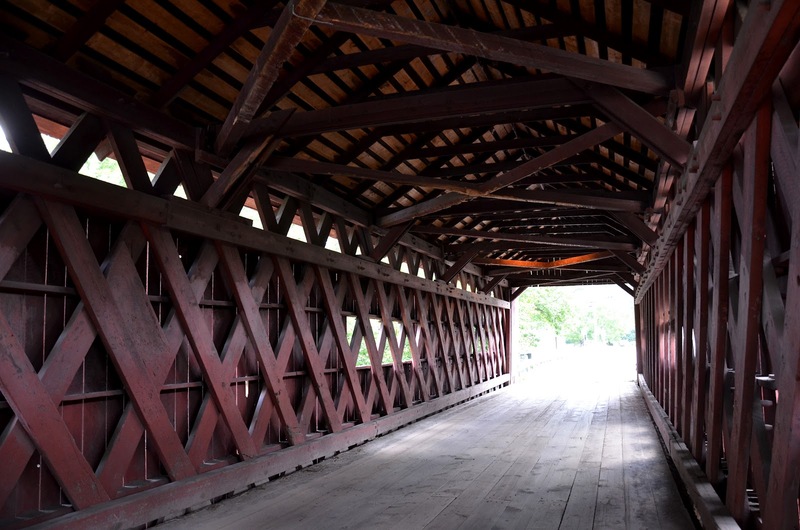 This view (left) of the inside of “Warren” bridge shows the “Queen Post” truss design, which holds up the roof. Vermont covered bridges – the majority built in the late-nineteenth century – favoured several different designs. 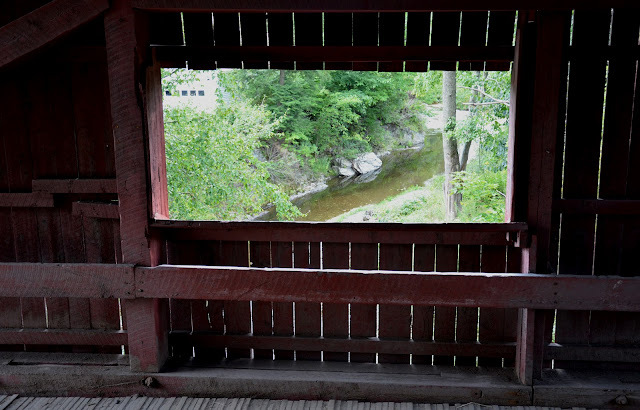 This bridge has two large windows giving views north and south of the Mad River below. Side-view of "Warren" bridge from the east side of Mad River. 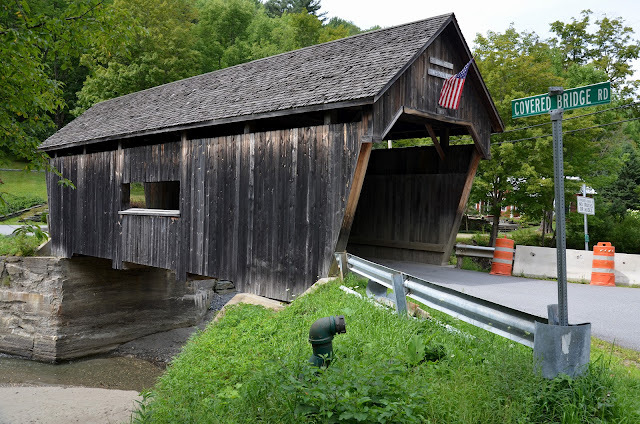 Here is a link to a website which provides details of the names and locations of most of the covered bridges in Vermont. Many details about the size, design and age of the covered bridges can be found on individual Wikipedia pages. Do a Google search using the name of the bridge. 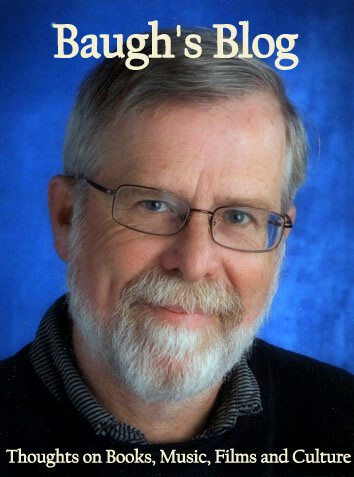 Tony alerted me to your blog post! just lovely - my only criticism is that you did not call upon us while in Vermont, which you must do next time you visit here! Thanks for your response! I'll look for that video you mention. Yes, we had a good time in Vermont. My wife has taken the kids there a few times to do skiing. She loves Vermont!